Some of my fans may not be aware of my interest in vintage car racing. 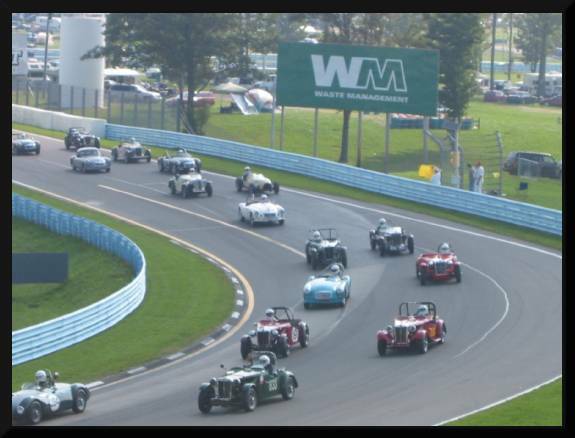 One of my reasons for wanting to go on this trip with the Princess was to see the SVRA Zippo U.S. Vintage Grand Prix races in Watkins Glen. There were lots of celebratory wine and cheese munching and hosted lunches at the track, and you know I’m not one to miss a good meal. 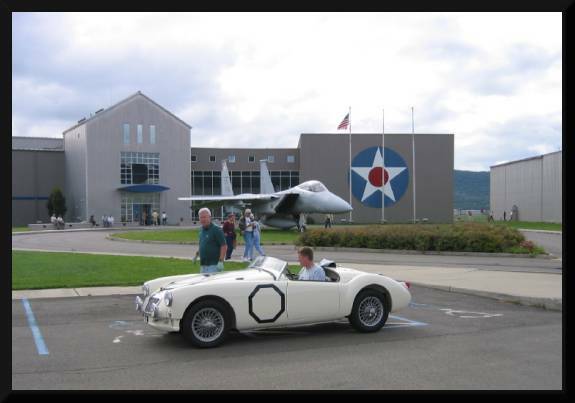 There was a much-to-do Tour de Marque for those with cars like ours from the Wings of Eagles, an airplane museum, to the racetrack. That’s one of the original MGAs that raced at Watkins Glen. I was astonished! Have a look at the number of cars that showed up! Once again the other guy didn’t miss a chance to get his picture taken. Always stealing my limelight. Well, I must say that the races were spectacular! People came from everywhere to see this momentous event. I drove the new racecourse and the old original Watkins Glen U.S. Grand Prix course. 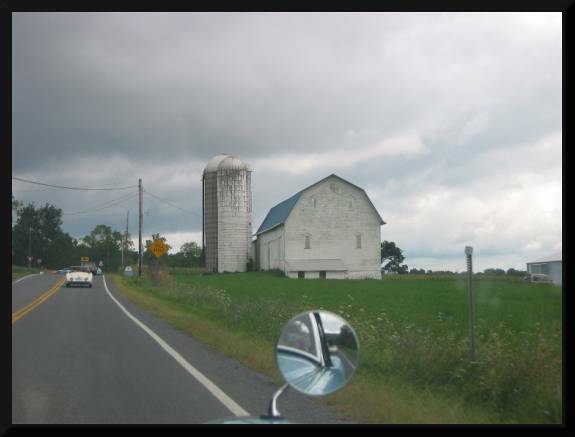 With farmland surrounding at all sides, I had to be watchful for wandering cows as well as the stop-and-start procession of beautiful old MGs. 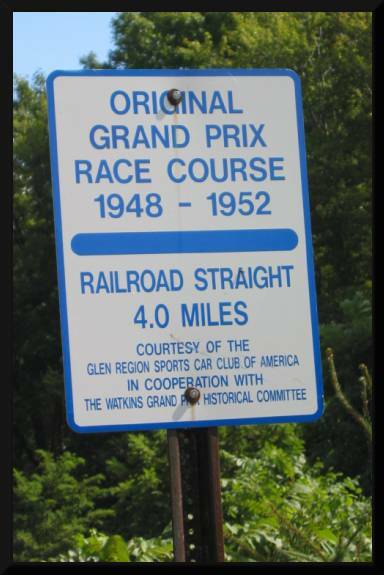 There were the signs at roadside, announcing race history as we drove down the hill toward Seneca Lake. 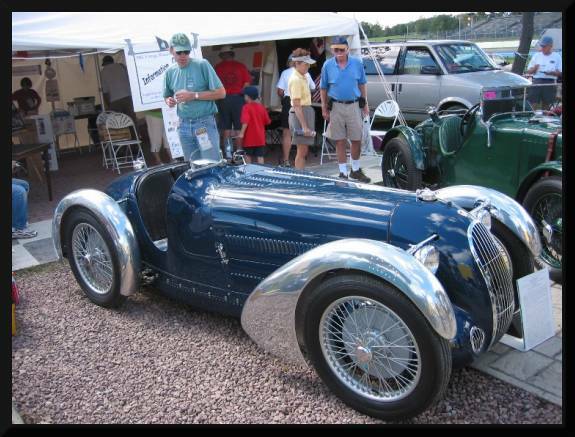 Over a hundred vintage cars showed up for the 50th anniversary of the Collier Memorial MG Trophy Race, named after two famous racing brothers, Sam and Miles. 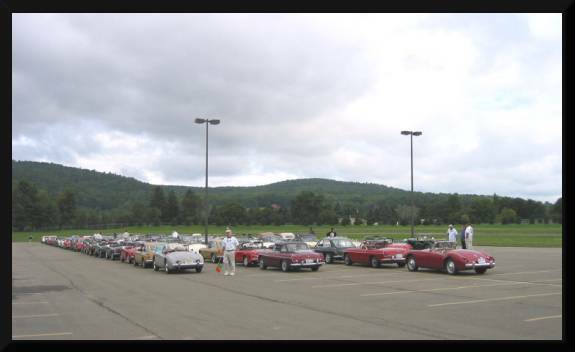 The MG turnout was the largest ever in the U.S. 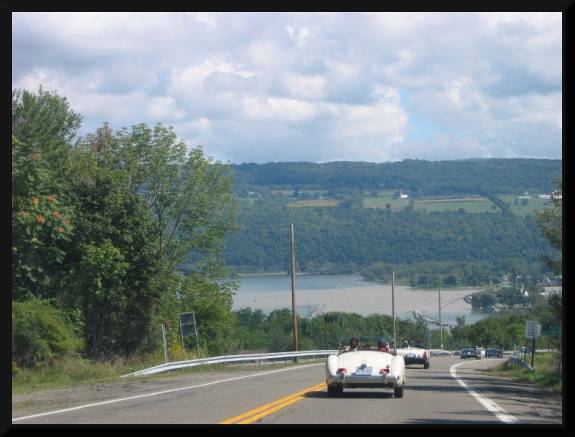 Please note: We drove the furthest of anyone (3,300 miles) to get to Watkins Glen. Skies were mostly clear, with a few puffy Simpson clouds drifting past over green hills. Ah, a glorious weekend for racing. As I wandered through the racecar pits, signing autographs, talking to drivers and taking pictures, I was moved by the camaraderie shared by all. Vintage car racing – the gentlemen’s races. 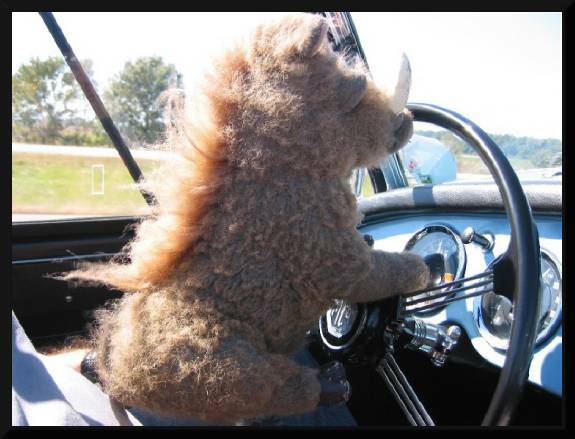 Some drivers seemed a little taken back by a handsome warthog, erudite as I am, knowing so much about vintage racing. Each morning, as is my custom, I was ‘ready to go’ before the other guy could get out of his bed. Age is catching up with him. We spent a few days after the races, resting up and enjoying the beauty and colors of the New York woods. Notice that the other guy hasn’t been scrimping on meals. Must there always be elements that threaten good times? 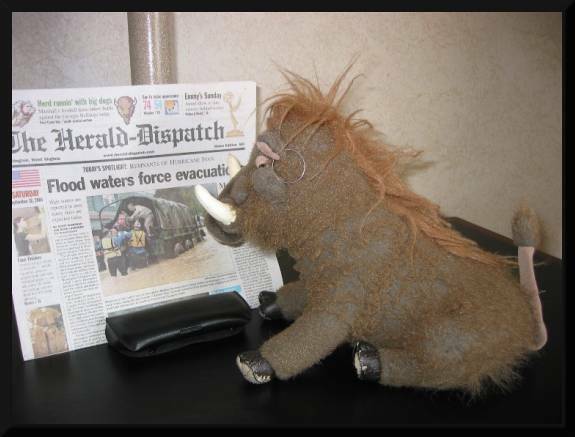 From what I read in the paper and saw on television weather news, a huge hurricane was wreaking havoc as it smashed into the Gulf States and proceeded in our direction. Hoping to avoid the worst, I lobbied, wisely I might add, to get back on the road for home before the storm overtook us. I ever offered to drive. Our car was already manifesting electrical problems, most likely due to the earlier rains, and I was concerned that things might get worse. They did. Once again, I loaded our gear into the car and we headed southwest for Pennsylvania and hoped-for sanctuary. 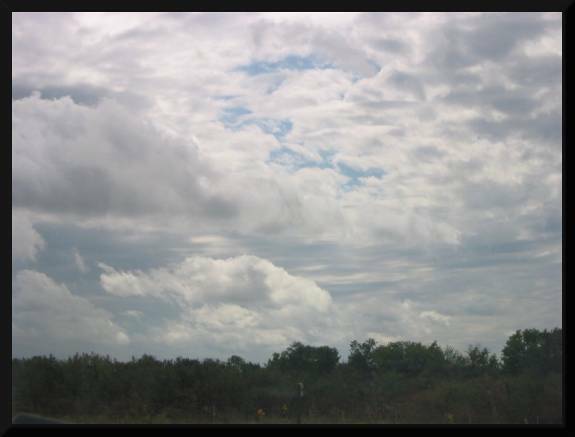 Skies were clouding. Once blue was replaced by gray. We didn’t tarry, stropping only for fuel and necessary snacks. 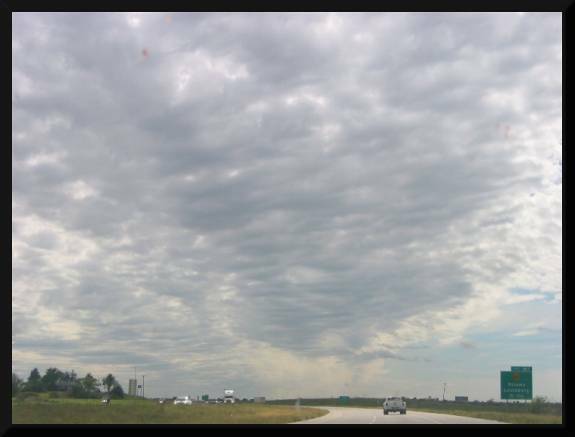 By the time we got to Milesburg, it was four in the afternoon. We were in need of serious rest and a substantial meal. At least I was. With threatening clouds blowing our way, we setting in for the night. Once again it was a race against weather…the rain getting heavier by the hour. We made it as far as Milton, West Virginia before the headlights stopped working and the windshield wiper burned out in the deluge. The other guy was driving, and for once I was very glad that I wasn’t at the wheel. Heard the old expression about it raining cats and dogs? It was raining cattle! It was with great good fortune that we found a small auto repair place just a few blocks off the freeway. Hubie Hatfield, the proprietor, quickly made room in his two-bay shop for our car. What a nice man. While Hubie looked under the hood, the other guy made a phone call, and ordered parts delivered overnight from the west coast. Mrs. Hatfield, out of the kindness of her heart, drove us down the road to Barboursville so we could get a motel room for three days while the car was being repaired. Apparently there weren’t any motels in Milton. Did I mention rain? The streets were flooded curb-to-curb; automobiles were stalled in deep waters. This was a very serious disaster! Ivan the Terrible was doing his terrible feeds! Half of the eastern states were flooded. Lucky for us there was a place to eat right next to our motel. Don’t for a second think that I was about to let some rain make me miss a meal. It was only fifty yards - door to door. It took three hours for me to get dry! The next day we called a cab and took in a movie at a nearby mall. Sky Captain? Something like that. Lots of action, villains and heroes. My kind of movie. One large bag of popcorn, not enough to spoil my dinner that evening. 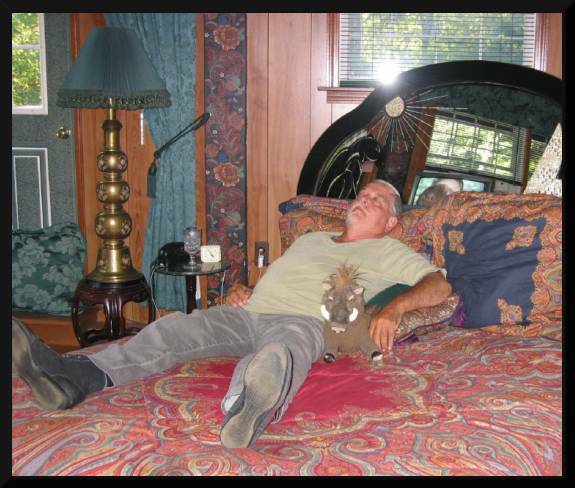 I was ready to get back to the motel as my right hoof had become cramped from signing autographs for my fans. 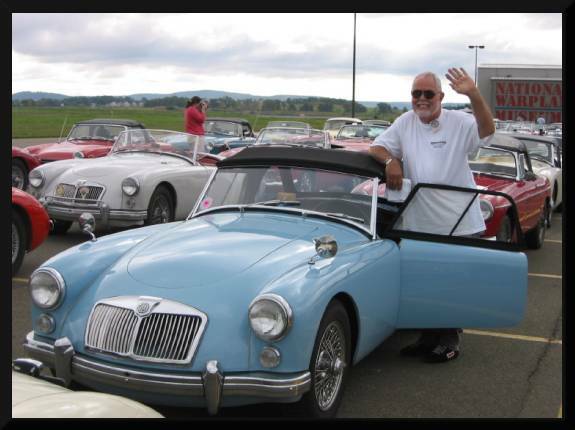 Well, Mr. Hubie Hatfield, automotive genius I’m sure, repaired our forty-four year old British vehicle in one day, replacing the electrical wiring harness which burned-out because of the shorted windshield wiper motor. Got that? I trust I’m not being to technical for you, dear reader. We paid the bill and were back on a sunny road, happy that the rain had blown past. Corydon, Indiana was our next motel stop. We needed our rest, for the next day was going to be a run for the great Mississippi. I slept like a log! Now I need a rest, and naturally prior to that, I need a nice dinner. Back to tell you more as soon as I recuperate.